The post 5 Easy Backyard Games for Dogs by Nikki Moustaki appeared first on Dogster. Copying over entire articles infringes on copyright laws. You may not be aware of it, but all of these articles were assigned, contracted and paid for, so they aren’t considered public domain. However, we appreciate that you like the article and would love it if you continued sharing just the first paragraph of an article, then linking out to the rest of the piece on Dogster.com. Backyard games are a great source of activity for high-energy dogs, those who are watching their weight, and just about any pup who loves to play. They can also provide your pooch with a few behaviors that will impress your friends — especially the nosy neighbors who are always looking over your fence. Here are five backyard games for dogs to make the most of those final days of summer! Fetch is a standard and fun backyard game. Photography ©vikarus | iStock / Getty Images Plus. “Fetch” is standard backyard fare for dogs with a decent retrieval instinct. Running to retrieve a ball or toy is great exercise and reinforces the human-doggie bond. Some dogs don’t need to be taught to retrieve toys. You know you have one of these pups if you’ve ever tripped over a Frisbee or have had a slobbery shoe set at your feet. These dogs are a delight when playing retrieval games and may exhaust themselves quickly, so offer enough water during playtime. You can encourage dogs without an ingrained interest in retrieving to pick up a ball, too. How? By smearing peanut butter or cheese on it; you can also use your dog’s favorite toy. 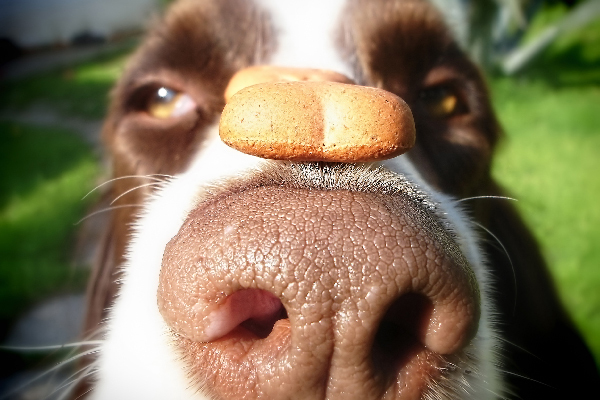 Some dogs aren’t “mouthy” and won’t pick up a thrown toy, but you can reinforce the “picking up” behavior by first rewarding any contact with the ball with a treat. As you continue to teach this game over a series of days or weeks, raise the criteria so that you eventually only reward for picking up the ball, and then for bringing it back to you. For the possessive dog, use a ball rather than a favorite toy, and once it’s in your dog’s mouth, show him that you have treats. Than, offer to trade the ball for a treat. Do this until your dog understands that if he chases and then relinquishes the ball, something good happens. Eventually, he’ll forget about the treat and relish the game for the game’s sake. Agility is an athletic and competitive dog sport that requires a dog to navigate an obstacle course. You don’t have to enroll your dogs in classes or compete to have fun with it. Inexpensive backyard agility equipment is available online, or you can even make your own. Choose the agility equipment that would best suit your dog: jumps, tunnels, weave poles, tire jumps, chutes, or teeter-totters. Jumps are a great place to start, since it’s easy to teach a dog to comply using treats and positive reinforcement. Start with the jump pole on the ground, and have your dog walk over it. Once he’s good at that, raise the jump just a few inches, and continue raising the jump as your dog becomes familiar with the game. Treat-dispensing toys are best left in the backyard. Photography ©Bill Chizek | iStock / Getty Images Plus. These are wonderful to use in the backyard because your dog will have ample space to play with them and you can leave all the resulting slobber and noise outside. Once your dog understands how to use these toys, you can start hiding them in corners of the yard, or under bushes and behind trees to make the game even more challenging. For dogs who play rough, the Unbreakoball is a fun choice, as are Kong toys and the Tug-a-Jug from Petsafe. For puppies, use a soft toy that’s easy on young teeth and gums. For dogs who like to dig, having a dedicated sandbox is like owning a little corner of heaven. Use a child’s sandbox with a cover so that neighborhood cats don’t make it a litter box and leave your dogs a few tasty snacks. Use only clean sand from your local hardware store. Bury your dog’s favorite chewies in the sandbox and show him how to dig them up. Soon he’ll understand that he will be rewarded for his efforts — and you’ll avoid having to fill in another hole along your fence. A kiddie pool is great for supervised backyard play. Photography by tcsaba/Thinkstock. 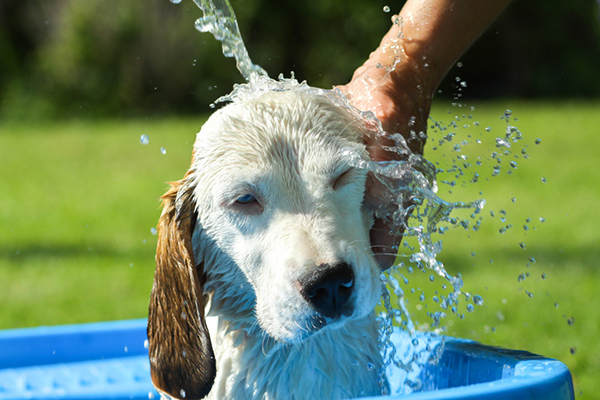 A shallow plastic pool can mean hours of backyard fun during the summer months, when your dog may want to cool off with a dip. Toss apple slices, baby carrots, or your dog’s favorite treat into the pool for a kind of “bobbing for treats” game. This is a great way to persuade skeptical pups to get their feet wet. You can also fill the pool with floating toys and balls. Only play with an unleashed dog in a fully fenced backyard to avoid losing him to something more interesting, like a squirrel or another dog. Always supervise any backyard game, especially if toys or water are involved. Refrain from playing “chase” as a backyard game. This teaches your dog to run away from you rather than come to you. 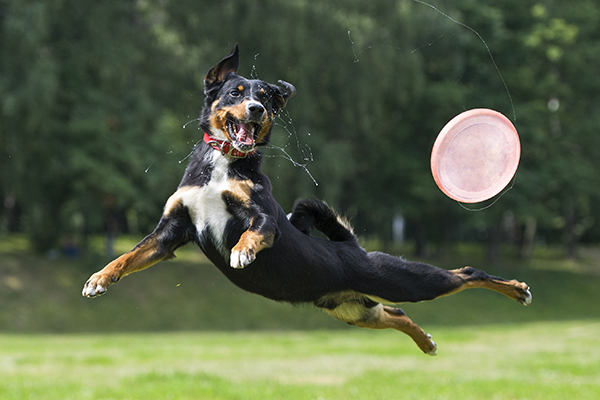 Tell us: What are your favorite backyard games to play with your dogs? Thumbnail: Photography ©M_a_y_a | iStock / Getty Images Plus. We’re celebrating the Dog Days of Summer on Dogster.com this August! Join us for insight on summer fun, grooming, safety and more. Editor’s note: Have you seen the new Dogster print magazine in stores? Or in the waiting room of your vet’s office? This article appeared in our April/May issue. Subscribe to Dogster and get the bimonthly magazine delivered to your home.